Player A carries ball forward, B calls for (long or short) ball & negotiates obstacle,& then passes to C who passes to the next group. Set up as shown in diagram Groups of 3 in 10 x 10m grid. 1 Ball per group. 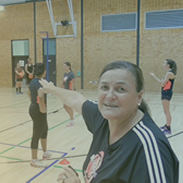 Coach to call Left or Right to ensure no collisions. How To Rugby - Evasive Running Drill.